What’s in a name? You may recall Enkelination, the Finnish band who released the ‘Tears Of Lust’ album back in 2014. 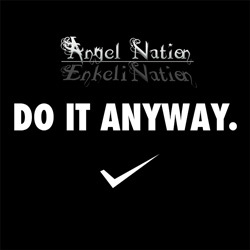 Founder member vocalist Elina Siirala and guitarist Shadow have opted to change their moniker to the more anglicized Angel Nation, and that’s not all. Augmented by a new rhythm section of Julia on bass and Lucas on drums, if this three-track EP is anything to go by they appear to be steering their metal baby in a slightly new direction, with maturity and a better idea of what they want to be resulting in shorter, snappier songs and a move into the light. The lead cut ‘Do It Anyway’ is a ridiculously glorious slice of power pop, not dissimilar to Delain at their most commercial. The vocals are luscious, the lead solo expertly executed, and once Lucas fires up the double bass pattern in the chorus it kicks up a gear and turns into a proper party animal. ‘Devil’s Voice Inside’ is a shorter, weightier little beast, but no less accessible for it, with a neck-wrenching opening riff giving way to a fabulous singalong section which will no doubt be a cracker at gigs. Things are wrapped up by a storming live version of ‘Tears Of Lust’ cut ‘Never Ending’ which showcases how heavy the band are when let loose on stage.